Perhaps one of the most diverse entertainers in the world today, Basile has entertained millions of comedy fans in the United States, Canada, Europe, Australia, and Africa. Basile's unique blend of material, improvisation, and characters has made him one of the most sought after comedians in the entertainment industry today. 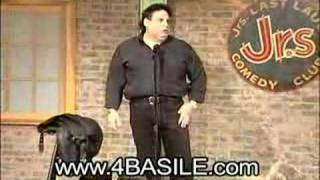 Basile's diversity in entertainment continues as he stars in his critically acclaimed series, "Growing Up Greek In Perhaps one of the most diverse entertainers in the world today, Basile has entertained millions of comedy fans in the United States, Canada, Europe, Australia, and Africa. Basile's unique blend of material, improvisation, and characters has made him one of the most sought after comedians in the entertainment industry today. Basile's diversity in entertainment continues as he stars in his critically acclaimed series, "Growing Up Greek In America." Thus series of three concert specials, is spoken in Greek and English and is distributed worldwide. Basile's voices and characters have been heard on Armed Forces Radio, Television, syndicated radio in North America, and on XM Satellite Radio. Basile has over 100 television appearances throughout the world, including HBO, Showtime, Comedy Central and the Jay Leno Show on NBC to name just a few. Basile is also known for his voice work as Universal Studio's Bullwinkle J. Moose, as well as for Cartoon Network and many Japanese Anime series.merica." Thus series of three concert specials, is spoken in Greek and English and is distributed worldwide. Basile's voices and characters have been heard on Armed Forces Radio, Television, syndicated radio in North America, and on XM Satellite Radio. Basile has over 100 television appearances throughout the world, including HBO, Showtime, Comedy Central and the Jay Leno Show on NBC to name just a few. Basile is also known for his voice work as Universal Studio's Bullwinkle J. Moose, as well as for Cartoon Network and many Japanese Anime series.